During the financial year 2013-14 SJVN Limited plans energy generation of 6930 million units (under Excellent parameters) with an expected revenue realization of Rs. 1783 crore and net profit of Rs. 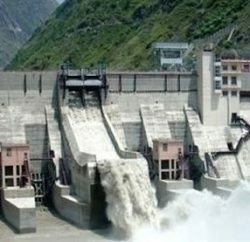 790 crore from its 1500 MW Nathpa Jhakri Hydro Power Station (6875 MU) as well as upcoming 47.6 MW Khirvire Wind Power Project (55 MU), in Maharashtra. The Company’s Wind Power Project is scheduled to be commissioned in August 2013. 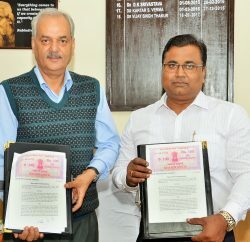 The MoU also provides for commissioning of all the six units of 412 MW Rampur Hydro Power Project between 15th Dec., 2013 to 5th March, 2014. A Memorandum of Understanding (MoU) to this effect was signed between P. Uma Shankar, Secretary (Power) Govt of India and R.P. Singh, CMD, SJVN Ltd. at New Delhi on 25th March, 2013. The MoU targets for providing training in Skill Development to 300 youths, farmers, womens and disabled persons to promote employability and self employment through training courses in I.T.I.s and other accredited agencies. For the development of backward districts in its project area SJVN will also organise 10 health camps and provide skill development to 100 persons. For providing Health Services to old age, disabled and women at their door steps, SJVN will organise 4 Mobile Medical Units, and 20 Specialised Health Camps. During the year, a budget provision of 1.3% of the Profit After Tax (PAT) has been made for expenditure on various CSR (Corporate Social Responsibility) and Sustainable Development activities in the project affected areas. Besides, a provision of 0.5% of the PAT has been made for R&D expenditure. During the year SJVN will also formulate a Risk Management Policy and its operations in its various projects. For its Meritorious CSR activities especially Social Development & Impact, SJVN was recently awarded the prestigious ‘Vishwakarma Award’ by Construction Industry Development Council (CIDC), a body established by the Planning Commission (Govt. of India) and Construction Industry. 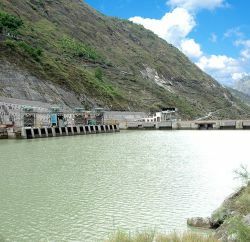 The MoU includes targets for construction of the 588 MW Luhri and 51 MW Jhakhol Sankri HEP in Uttrakhand besides completion of the 412 MW Rampur HEP in Himachal Pradesh. During the year SJVN will also ensure skill development of at least 90% of its employees through various management/technical programmes viz. competency & leadership development, Risk Management, Project Management etc. It will also ensure representation of minorities as well as women in fresh recruitments. For the sustainable development of safety, quality and environment management, SJVN will ensure compliance of the laid down parameters during the year 2013-14.